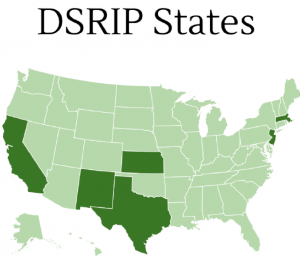 Fast Fact: More than $32 billion is spent on DSRIP in 8 states. This Fast Fact is part of a series in partnership with the Georgia Health Policy Center (GHPC), the national coordinating center for Bridging for Health: Improving Community Health Through Innovations in Financing, sponsored by the Robert Wood Johnson Foundation. Read the full Fast Facts series! In total, more than $32 billion is being spent on Delivery System Reform Incentive Payments (DSRIP) initiatives nationally in eight states. While the majority of these funds are being used to expand Medicaid eligibility and clinical services for low-income residents in participating states, the DSRIP initiatives also are bringing renewed focus on addressing social factors that impact health. This presents opportunities for those in community development to partner with DSRIP stakeholders on non-clinical drivers of well-being for Medicaid beneficiaries, including housing and transportation. Delivery System Reform Incentive Payments (DSRIPs) are part of broader Section 1115 Waiver programs developed after the passage of the Affordable Care Act . According to the Centers for Medicare & Medicaid Services, the 1115 waivers give states additional flexibility for designing improvements to their Medicaid and Children’s Health Insurance Program (CHIP) efforts that align with the program goals of providing increased access to quality health care for low-income populations. Increasingly, these waivers are being used to make extensive reforms to how states pay for and deliver health care services. Specifically, these pilot demonstration projects expand Medicaid or CHIP eligibility, increase covered clinical services, or enact delivery system reforms that increase the coordination of care. DSRIPs are not grant programs, but rather based on performance. Funding is tied to milestones, which vary over the funded time period (three to five years). The exact metrics vary state to state, but generally early-year milestones are related to process improvements, such as system redesign (e.g. innovative models for care delivery) and infrastructure development (e.g. technology investment and workforce expansion), while later years are outcome-based measures tied to health improvement for covered populations (e.g. patient safety metrics and overall health status). 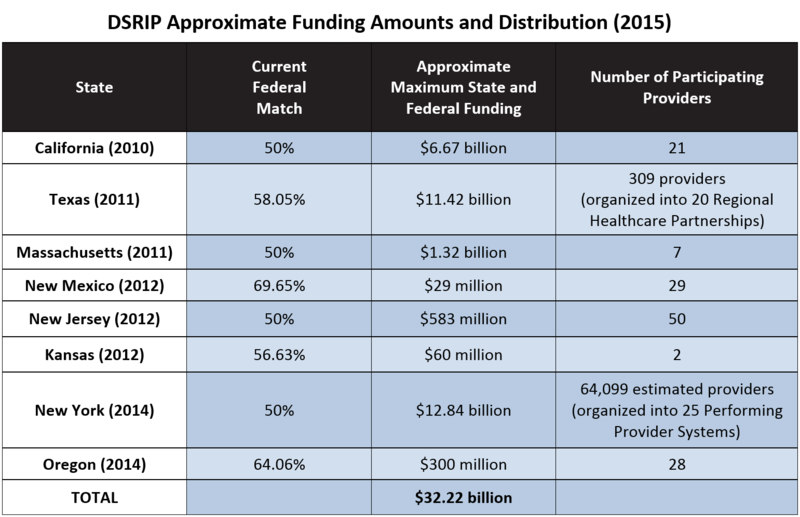 Just as with Medicaid, DSRIP requires states to match federal funding received for their initiative. Additionally, DSRIP waivers must demonstrate budget neutrality for the federal government. This means states must demonstrate their DSRIP initiative will generate savings that will reduce the federal government’s financial burden of Medicaid in future years (the cost without the 1115 waiver). These savings are essentially repurposed and directed towards additional DSRIP investments. There is no official federal guidance about DSRIP program requirements. Given the experimental nature of the program, the scope and the scale of DSRIP initiatives varies state to state. Early analysis shows that the DSRIP initiative has had noticeable impact in increasing coordination of care between care providers and between the health care system and social services organizations. While DSRIP initiatives do not explicitly require hospitals or providers to establish partnerships with social services agencies, they have brought renewed focus on the need to address social issues that influence Medicaid patients’ health. In other words, DSRIPs provide the community development sector an opportunity to partner with health care providers to influence the health of Medicaid beneficiaries through a comprehensive approach that addresses non-clinical drivers of health and well-being, including housing and transportation. Source: Adapted from Schoenberg M, Heider F, Rosenthal J, Schwartz C, Kaye N. “State Experiences Designing and Implementing Medicaid Delivery System Reform Incentive Payment (DSRIP) Pools.” National Academy of State Health Policy. March 2015. MediCal’s Public Hospital Redesign and Incentives (PRIME) Pool builds upon its initial Bridge to Reform DSRIP program to improve the quality and value of care provided by California’s safety net hospitals and hospital systems. The renewal expands participation from the state’s 21 public hospital systems to now include 42 safety net institutions run by health care districts that are predominantly located in rural areas. The Global Payment Program streamlines funding sources for care for California’s remaining uninsured population and creates a value-based mechanism to increase incentives to provide primary and preventive care services and other high-value services. The Dental Transformation Initiative provides direct incentives to providers to promote children’s utilization of preventive services and oral health disease management, expand prevention and risk assessment models, and increase dental continuity of care. The Whole Person Care regional pilots focus on the coordination of health, behavioral health, and social services in a patient-centered manner to improve beneficiary outcomes through more efficient and effective use of resources. 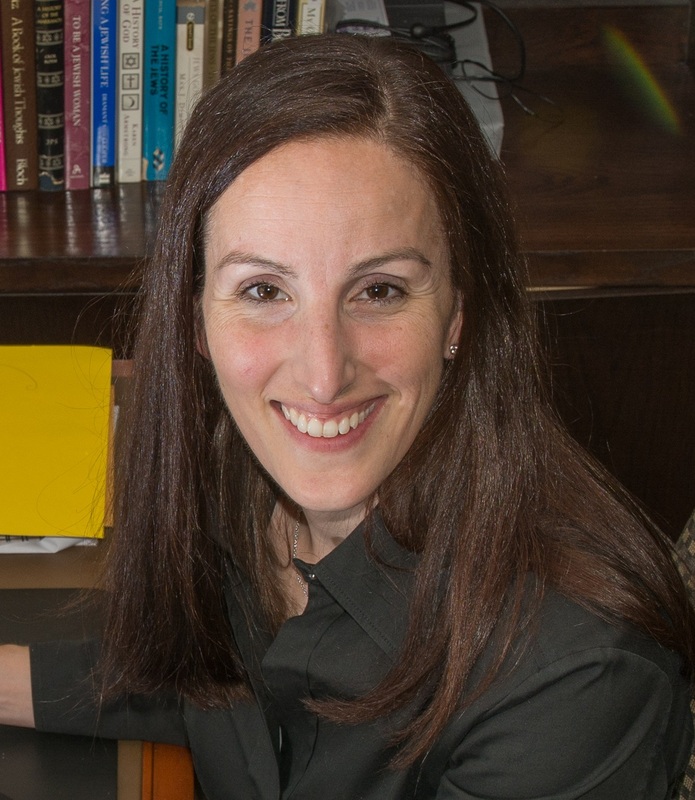 Lori Solomon is the communications and marketing manager at the Georgia Health Policy Center. She assists with communications for the center’s Bridging for Health: Improving Community Health Through Innovations in Financing, sponsored by the Robert Wood Johnson Foundation.